A few more 24 hour iPhone applications are appearing in the iTunes App Store. If you want to check any of these out, let me know how they work – I have no idea. This next one is a puzzle. It’s called iWatch, and it features an attractive rendering of three watches, including this Patek Phillippe watch with a 24 hour rotating dial. What looks like the hour hand is really the minute hand, and what looks like the minute hand is really the second hand. So the time on this picture is about 04:18:49. (I’m not a big fan of the design, to be honest. The map is coarse, and that font isn’t attractive.) The real puzzle, though, is why this app is suddenly no longer available on the App Store, now that I want to provide a link to it. Feeling overstretched? 24 hours in a day is not enough? Then 25h is a clock for you. Trick yourself into having 25 hours in a day. Get things done faster and have an extra “hour” for yourself. Note that 25h does not modify time–space continuum (or your biological clock) to give you an extra hour. It simply makes the rest of your hours appear a little shorter so that enough time is saved for an additional shorter “hour” at the end of the day. I know some people who set their watches fast – this is an interesting alternative. The illusion of a circular wheel rotating is very strong, particularly when you flick it up and down with your finger – it speeds up and slows down like a well-oiled bicycle wheel. But the display is effectively a digital clock that’s also a linear analog clock. Measuring time as a point along a line is probably as old as angular time measurement, if not older. Early sundials from Egypt show the length of the sun’s shadow being measured on a simple graduated stick, although angular displays are also common in the ancient world. Through history the passage of time has also been marked by a change of water level, a decrease in height of a marked candle, or a change in length of a trail of slow burning incense. A striking linear clock can be seen in Picadilly Circus tube station in London. A metal band travels from east to west over a fixed Mercator map of the world, showing the mean solar time for any location. The band itself is a 24 hour indicator, but if you think about it, it’s clear it has to be 48 hours long (since it has to go round the back of the map). There are a number of software linear clocks around. 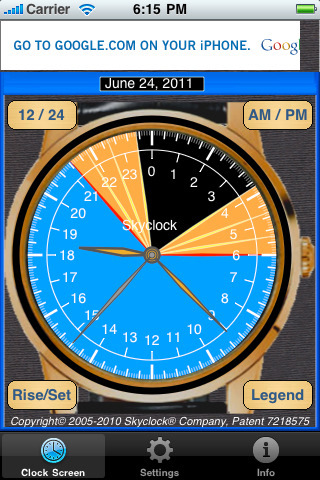 Here’s an old one called Stripclock that I used to run on my Palm. (You can google for this but there’s no current url for the author, who might be called Fraser McCrossan) This was great because by tapping you could zoom in closer and closer onto the time display – either watch the seconds speed by or follow the imperceptible movement of the week or month. Notice that this style of display has exactly the same ‘problem’ as circular analog clocks: it’s hard to show the various time units to any proportional scale. A second is as big as a minute, although they move to the left much faster. This is a great picture of time flowing like water under a bridge. This screensaver is a version of a fascinating watch designed in the early 1970s by engineer and designer Tian Harlan. 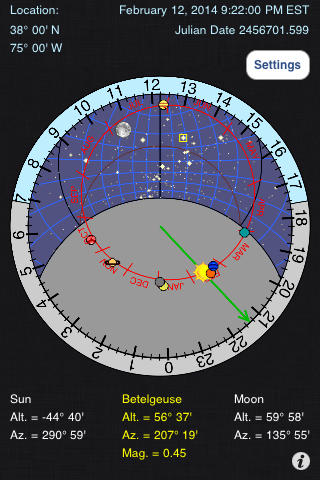 I’ve made a 24 hour analog version as a screensaver for MacOS X, using Quartz Composer. The Chromachron time display method was invented by artist and designer Kristian Harlan in the 1970s. ‘Tian’ Harlan was born in Berlin, in 1939. He studied Architecture in Berlin and became a qualified engineer. In 1972 he designed the Color Time sculpture for the Olympics Games in Munich. In 1973 he released the first Colour-Time graphics and objects. The Colour-Time watch, which had a mechanical movement, was manufactured by Chromachron A.G. in Germany. On a Chromachron device, the time is indicated by the color and angle of a slit in a rotating disc. Beneath the disc the circle is divided into 24 sections (in the original 12 hour version, the disk was divided into 12 sections). Time is indicated both by the color of a slit in a revolving disk, and by the angle of the slit (similar to the hour hand of a conventional clock). The disc revolves at the speed of one coloured segment per hour, so that it is not possible to read the exact time: five minutes before twelve is read as a short time before yellow. This approximate time measurement system was described as ‘ending the dictatorship of the exact time’. In total, Harlan designed approximately one hundred different watches. His work has been exhibited in Berlin, London, Amsterdam and Paris. It’s said that his Colour-Time watches were worn by, amongst others, Ringo Star, Max Bill, Charles Aznavour, and Carlo Levi. I’ve finally managed to work out how to add some options, so there’s a noon at the top option, a digital readout, and a way of adjusting the thickness of the coloured rim. Put the contents of the Zip archive in your screensavers folder. You can edit this file in Quartz Composer. If you make any interesting improvements, let me know!